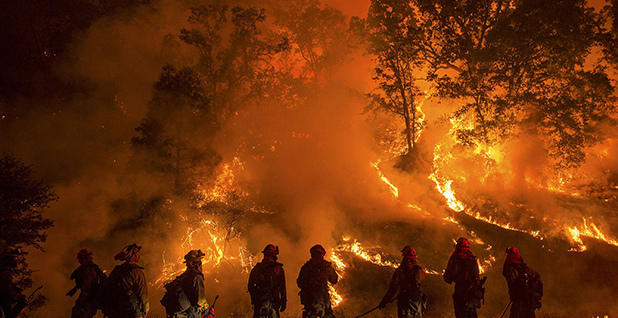 Wildfire season set a record last year with more than 10 million acres burned. But determining what role global warming played, scientists said, is a tricky business. Photo by Jeff Head, courtesy of Flickr. Scientists and forest agency officials yesterday said they see a link between climate change and the record-breaking 2015 wildfire season. Parsing the exact role a changing climate played in the historic burns can be challenging, especially in Western forests overstocked with woody kindling due to decades of fire suppression and a relatively hands-off forest management policy. But, experts agreed, there is clear evidence that a warmer, drier climate played a central role. "We do see a climate change signal in the fire seasons we're having," said Jennifer Jones, a public affairs specialist with the Forest Service's office of fire and aviation management. "It's climate change, it's hazardous fuel buildup, it's nonnative species invasions, it's insect infestations. Climate change is part of that, but in any given season, it's impossible to know how much." More than 10.1 million acres of U.S. forests -- private, state and federal -- were scorched last year, marking 2015 as the most extensive and expensive fire season on record, according to numbers released Wednesday by the Forest Service. The agency was forced to "borrow" three times from non-firefighting funds to pay for fire suppression. The agency reported spending more than $2.6 billion, or 52 percent of its budget, on firefighting efforts in 2015 (Greenwire, Jan. 7). A little more than half of those acres, 5.1 million, burned in Alaska. As it has for the past few years, fire season came early to the Last Frontier. What little snow did fall melted away quickly when warmer-than-average temperatures hit the state in March and April, said Tim Mowry, public information officer for the Alaska Division of Forestry. A deluge of lightning strikes helped ignite hundreds of fires over the course of the dry summer months. "Our fire seasons have been starting earlier and lasting longer, and we've tended to have bigger fire seasons and more acreages burned," he said. A few years ago, the Division of Forestry moved up the beginning of fire season from May 1 to April 1 in acknowledgement of the longer fire season. Pinpointing the impacts of climate change is hard to do, Mowry added, but four of the 10 largest fire seasons in the state have occurred since 2004, an "indication there is something going on." In the West, a combination of factors fueled a fierce fire season. Warm springtime temperatures, prolonged drought in the West, gusty winds and shifts in precipitation from snowpack to rainfall marked the 2015 season, according to the National Interagency Fire Center. Penelope Morgan, a professor and fire ecologist at the University of Idaho, said there "is no doubt" changes in climate are contributing to an uptick in fires, especially across the West. In Idaho, where Morgan's work is focused, the fire season has grown 32 days since 1984. High fire years, she said, almost exclusively are marked by warmer-than-average spring seasons followed by warm, dry summers. Although scientists aren't sure exactly how warming temperatures will manifest under climate change, Morgan said that "chances are good as it gets warmer we'll get more dry years in the future." Not only will fires get larger and more frequent, but water in streams and in soils will decrease. Low moisture played a role in the 2015 season, said Frankie Romero, a Forest Service fire and fuels specialist with the National Interagency Fire Center. In many parts of the drought-stricken West, the Forest Service observed tree mortality even in places where fires were not severe. "Vegetation is drying out quicker and is less able to withstand the impact of fire when it passes through," he said. "A lot of these trees were stressed-out enough that a little bit of disturbance caused them to throw in the towel." In addition, Romero said, in some places, fire management officials have observed more instances of extreme fire behavior. "The acreage, 10 million, that by itself is a concern to us mostly because we know we're behind the curve in getting our landscapes into healthy conditions," he said. A Forest Service report released in November found the agency performed restoration treatments on 4.6 million acres in 2014, which is 400,000 more acres than it treated in 2011. Progress, however, is threatened by the increasing cost of fighting wildfires. The goal of forest management is to restore the ecological health of forests so they become more resilient to fire. Thinning and controlled burns are the two most common practices (Greenwire, Nov. 10, 2015). Driven by drought and low snowpack, 2015 broke all the records in Washington state. As Ryan Haugo, a senior fire ecologist with the Nature Conservancy, explained, "It was a traumatizing fire season." In preparing for future condition under climate change, he falls into the camp that looks to forest management as a way to build resilience. Areas that have received treatment look vastly different from those that have not, he said, citing a recent example. Ponderosa pines, a species typically well-adapted to fire, almost completely perished in an untreated area hit by the Taylor Bridge Fire, which blazed out of control during the hot summer months of 2012. Fires ignited in September and allowed to burn themselves out in a controlled manner produced forest landscapes where smaller trees were burned and killed, but larger ones survived. The effect is "patchy" and should prevent future fire from charring the entire landscape, Haugo said. Charred landscapes affect hydrological cycles and biodiversity and are more susceptible to things like mudslides. Severe fires also increase the change of forestlands being unable to recover and shifting to grasslands. "I think we have the tools, but having the many different kinds of conversations we need to have and accepting we can't put out all fires will be tough," she said. "It's probably going to lead to different ways of managing where we live and how we live as people."